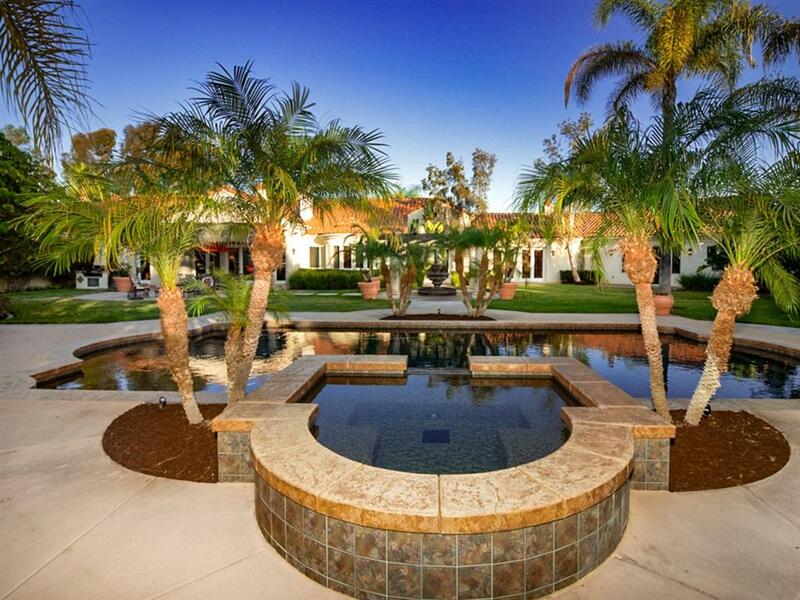 Custom single level Mediterranean Mansion on 2 acres of land tucked away on private cut-de-sac. Enter property on an elegant circular drive way, with grand entrance, a large foyer, stone floors, high ceilings, with decorative lighted soffits that frame the rooms. Light and airy home, all in an Italian country design, with 5 Master bedrooms, the grand master complete w/ retreat and fireplace, opens on to a Romantic garden including a fountain and Spa waterfall. Garden includes views detached La Casita. THE CIRCLE DRIVE LEADS YOU TO AN OVERSIZED 4-CAR GARAGE~~WITH A EXTRA LARGE GRAND MASTER SUITE AND INCLUDES TWO DRESSING ROOMS W/TWO BATHS & TWO CLOSETS, SITTING ROOM W/GAS FP HAS VIEWS TO THE EAST. CABINETS AND DOORS ARE CUSTOM MADE OF KNOTTY ALDER~THE KITCHEN IS A GOURMET DELIGHT, HAS GRANITE COUNTER TOPS, TOP ON THE LINE APPLIANCES INCLUDING, SUBZERO, DECOR DOUBLE OVENS, 6 BURNER STOVE WITH MATCHING HOOD, AN ADDITIONAL UNDER THE COUNTER SUBZERO TWO DRAWER VEGGIE FRIDGE IS INCLUDED, BASKET DRAWERS, 2 BOSH DISHWASHERS WITH SEPARATE PANTRY. BUTLERS PANTRY INCLUDES WINE FRIDGE AND CABINETRY~THE VAULTED FAMILY RM CEILING IS STAINED RAW CEDAR BEAMS WITH A STONE CLAD FIREPLACE FLANKED BY BOOKCASES AND CABINETRY. THE GAME ROOM HAS IT'S OWN WET BAR AND DESIGNED FOR A POOL TABLE. HOME AS A ALARM SYSTEM AND RECESS SPEAKERS THRU OUT. ~ SEPARATE GUEST HOUSE FEATURES A 'GRANNY KITCHEN' AND BAR INCLUDING A LIVING ROOM, BEDROOM AND BATH WITH BACK DOOR FOR EASY ACCESS TO POOL FOR YOUR GUESTS. THIS TWO ACRE LOT HAS A PAD FOR A TENNIS COURT OR PLAY COURT What I love about this home The City in the Country, This amazing City has much to offer, something for everyone, 55 miles of Trails ,Poway Lake, Lake Poway Archery, Horse Back riding Trails, Golf Courses , Tennis, Swimming ,Fishing Boating, Wineries, Art, Old Poway is fun for everyone. This area is known to Be the home to many Famous sports Figures. Listing provided courtesy of Spirit Realty Inc.. Listing information © 2019 San Diego MLS, Inc.